This photo is of our family, the Tollman family, in the place we call 'home', the wilds of Southern Africa. 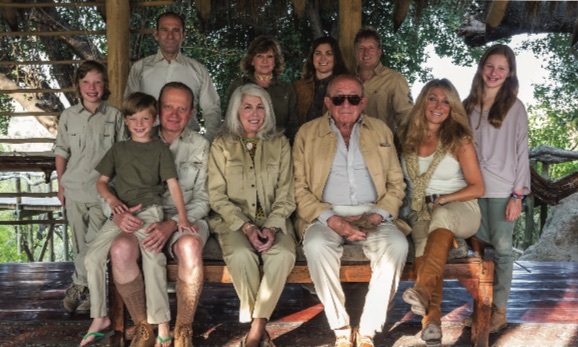 The Travel Corporation (TTC) Chairman, Stanley Tollman, sits centre with his wife Bea Tollman. Surrounding them are their children, grandchildren, and nephews, all of whom play a critical role in the TTC business. Gavin Tollman (top left) is our leader of Trafalgar, our company CEO. 72 years in the making, Trafalgar introduces you to Africa; trips that have been crafted with firsthand knowledge, heritage, stories and secrets. It's the damp scent of acacia trees in the early morning sun, your eyes peeled for the sight of a leopard or lion. It's the taste of G&T sundowners with the hippos, on the banks of the mighty Zambezi River. It's your view of Umhlanga's iconic lighthouse from the five-star Oyster Box Hotel; a place that is sprinkled with Trafalgar's own family stories. It's embracing endless freedom in the Maasai Mara, the Serengeti and the Kalahari Desert. It's coming face-to-face with a lion, visiting local tribes in Namibia and tasting fresh oysters in South Africa's own Garden of Eden. It's realising how very small you are in this world; in this land of great contrasts and soul-stirring wonders. And, for Trafalgar, it's being able to share with you its love of Africa – its iKhaya, or 'home'. The photos are our own, and from a dear family friend, Mike Myers. The highlights and tips are ours, sprinkled with family memories. Join Trafalgar, discover the real thing and just live The Good Life. Trafalgar will welcome you into its family, sharing a taste of its life and stories. You'll see incredible wildlife up-close, but also go beyond the guidebooks to explore the contrasts of Africa, complete with Trafalgar's personal recommendations, family photographs, favourite memories, and 'pinch me' moments that will change your world forever. It's the people who make the places Trafalgar goes so special. Trafalgar will give you access to their stories over home-cooked meals as they welcome you into their homes. You'll savour 'Roester brood' (roasted bread), 'Umngqusho' (samp and beans) and 'Gemmer beer' (ginger beer) in Tsitsikamma, traditional Cape cuisine - including 'biltong' and 'bobotie' - at De Waal Winery in Stellenbosch, and a plethora of stories from the people you meet. Trafalgar goes out of its way to hand-select exceptional hotels for every itinerary. So much more than just a bed for the night, each of these unique stays has its own special story. Live the legacy and hear the history as you rest your head. Learn the secrets that only a local family could know. With Trafalgar's roots, history and heritage as a guide, your Travel Director will help you uncover the magic moments of Africa, revealing Hidden Gems and secret spots that you may never have the chance to discover alone. People who ordered Africa also ordered the free travel brochures below. Click on the images to find out more about these brochures.